Videos created and shared within the UBC Department of Physical Therapy. Watch now! Full list of videos here. Full list of forum sessions here (scroll down to find forum list in the navigation bar). If you have questions about physical activity or exercise, call 8-1-1 toll-free in B.C. You can speak to one of our qualified exercise professionals with cancer specific training who are available Monday to Friday 9am to 5pm PST. 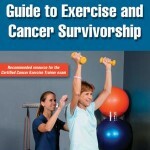 ACSM Exercise Guidelines for Cancer Survivors. A section of the American College of Sports Medicine with published guidelines for exercise and cancer survivors. A collection of scientific research publications on the theme of monitoring women with breast cancer during their treatment and recovery for the purpose of improving rehabilitation. Advisory panel member for development of physical activity message and materials, American Institute for Cancer Research.